There is so much activity going on around here, that the knitting has kind of taken a back seat. Spinning is much more relaxing and less taxing on a sleepy brain. I have been helping a friend out with refreshing the inside of her house – a lot of painting (ceilings are back-breaking! ), learning to replace outlets (without electrocuting ourselves), and learning to replace baseboards (power tools!). Needless to say, all of that physical activity is yielding several expected results: I’m happily exhausted by the time I get home, I have more energy, I’m learning new things (love this! ), and I’m losing inches (if not pounds). Her place is looking great, which makes both of us happy. 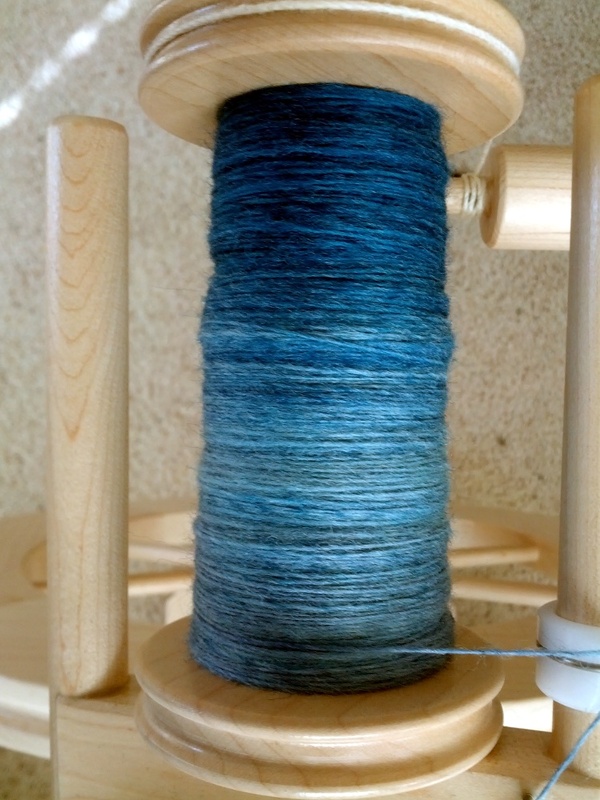 So I picked up the blue Masham – yet another sheep breed – fiber I had acquired last fall from a local indie dyer at Fiber Fusion Northwest and tried to determine how best to spin it. My wool books list Masham wool on the scratchier end of the spectrum, and suggest it is best used for household items like rugs, weaving, pillow covers, etc. My braid felt only slightly scratchier than the BFL I had just spun, so I decided I would spin it into a medium weight yarn and then knit it into a pillow cover. The blues ran along the length from light to dark to light again, similar to the purple Merino I spun earlier, so I decided to spin it from end to end and chain ply it to further smooth out the finished yarn and preserve the color changes. The singles just flew onto the bobbin. It wasn’t that much different than spinning the BFL, in my experience. 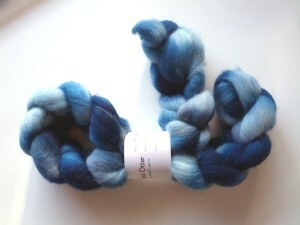 My friends who have experience spinning Masham were telling a much different story. Maybe my batch was processed differently? Or theirs was from a particularly scratchy sheep? The plying went really well too. Once I get the first few chains going, things just fall into a rhythm – I’m just crocheting the yarn, making super long loops to form the chain. This plying technique was a good choice for this yarn; the resulting yarn is smooth and even, with very little halo to prickle the skin. 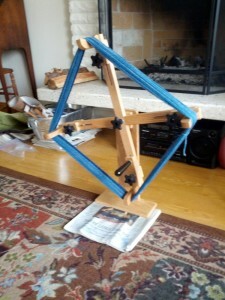 While I was away on vacation visiting family, I helped Dad engineer and build a skein winder. We even roped my son in on the math (yay algebra!). This one is adjustable for skeins from 1 yard around to 2+ yards around, and can be completely broken down for storage. So once the yarn was plied, I assembled the skein winder and tried it out. Success! This is so much easier than trying to wind it using a swift, which is typically used to unwind a skein. The right tool for the job. Thanks Dad! And here is the finished yarn. Isn’t it lovely? 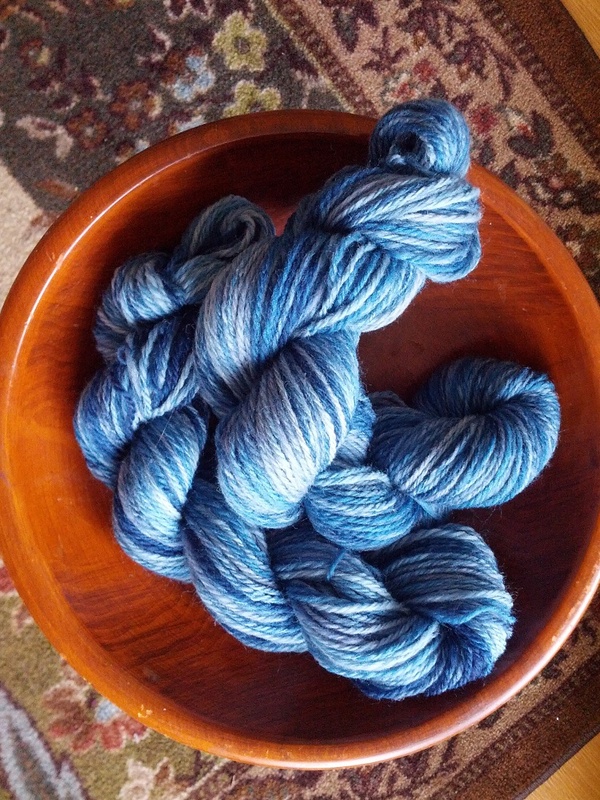 It’s ~320 yards at a heavy worsted knitting weight. The yarn is nice and round, and much softer than expected. I can see some fabulous texture and cables in our future. Next up: Some BFL in forest shades and learning a new spinning technique.